Denby can be safely used for cooking food in a microwave (it is not recommended that the microwave is used for warming plates), oven and for use in the fridge, freezer and dishwasher. Denby recommends using low temperatures and liquid detergents in your dishwasher. All pottery and china can crack if exposed to sudden changes in temperature, no matter how strong it is, so please don't take items from the freezer and put them straight into the oven or microwave, or expose to direct heat sources such as the hob or grill. 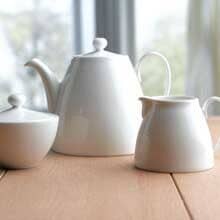 Take care when stacking and handling as scratches are more visible on coloured glazes.